Geelong Harmony Chorus is a women’s a cappella chorus with between 30 and 40 members who sing special four-part arrangements of contemporary ballads, classic songs, popular show tunes, and mainstream music. Think of the singing in the Pitch Perfect movies and you’ll get an idea of what we do. Geelong Harmony rehearses on Monday nights from 6.45-10.00 pm at Western Heights Uniting Church Hall in Douglass Street, Herne Hill. We perform locally at festivals and private events, and we are seasoned entertainers at Market Square Christmas celebrations, Ocean Grove Carols in the Park, and regular Citizenship Ceremonies at City Hall. We also compete on the national stage at the annual Sweet Adelines Australia Convention. If you’re a woman who loves to sing, you’ve come to the right place. We love to welcome new singers, so give us a call and come to a rehearsal where you’ll hear our beautiful ringing harmonies, meet our Musical Director, and see the fun we have. For more details, see our Membership page. 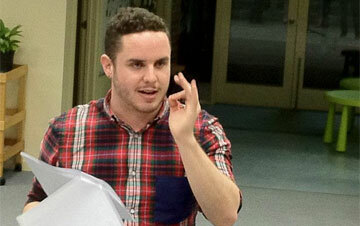 In 2012, Geelong Harmony appointed Alex Morris as Musical Director. Originally from Perth, Alex is a classical composer, arranger, Music Category Specialist of the Australasian Guild of Barbershop Judges and a much sought-after vocal coach nationally and internationally. Alex began his musical journey learning singing and violin when he was six years old. From years 2–12, he attended a school with a specialist music program. When he was 19 years old, Alex was appointed Musical Director for Perth Men’s Barbershop Chorus, Vocal Evolution, and took that troupe to Gold Medal wins in the last three national barbershop chorus competitions. Alex’s love of music is a vital part of his professional life and he loves the sound of ‘girl bands’. 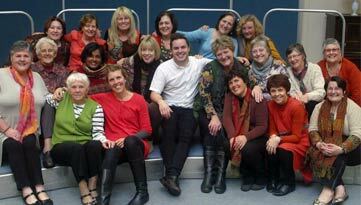 He brings Geelong Harmony’s singing to life with his expertise, passion, energy, wisdom and good humour. We are lucky to have such a talented Musical Director. He joins a small number of men who have taken on the role of Musical Director for a Sweet Adelines women’s chorus. Alex also works in artistic administration and stage management. 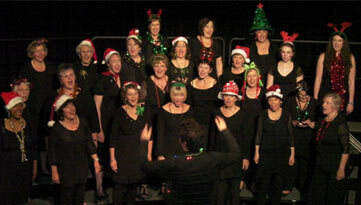 Geelong Harmony has been singing locally for more than 24 years. We were one of the first Australian choruses chartered to Sweet Adelines International, one of the largest organisations for women’s music education in the world! When the inaugural Sweet Adelines Convention was held in Geelong in June 1990, it caught the eye (and ears) of a small group of women. With Gwyneth Powell as director, the group of 12 gradually increased their numbers and began performing the barbershop style of singing in and around Geelong. They received their charter [into Sweet Adelines International] in May of 1994 just in time to sing for evaluation at the Sydney Convention. Eisteddfods became regular events for us as we usually scored well and came home with trophies and money. We have also performed in a number of wonderful venues outdoors as well as inside, and had some unique experiences. Among these, the Queenscliff Ferry promotion – singing as the ferry arrived and the motor bikes alighted, and singing in the pre Commonwealth Games program at Geelong in 2005. An emotional experience was performing a collection of songs for the Andrew Love Centre in 2007, on a balmy evening at Eastern Park Beach. Many and varied fundraisers, together with donations and grants from the City of Greater Geelong, have all helped to keep the chorus functioning as well as entertaining and promoting the Chorus in the community. 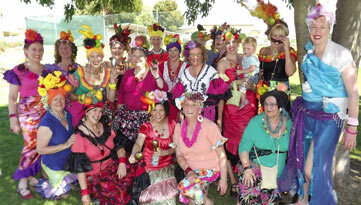 Geelong Harmony has been fortunate that the membership has remained steady at around 30. This is due to the friendly atmosphere created by its members and directors. Gwyneth stayed on with the Chorus for eight years despite having to travel from Melbourne for practice nights and sing-outs. With the support of her husband, Cliff, she encouraged the development of quartets and directed the Chorus at the Gold Coast and Adelaide Conventions. We were sad when Gwyneth retired but she left us in good hands. Mary Johnston, a chorus member, took on the job in early 1999. Mary was a busy doctor with a young family, and we appreciated all her time and efforts. As well as singing in a quartet, Mary directed us in competitions in Perth, Wollongong, and lastly, at the Adelaide Convention in 2004 where we came third in the small chorus section. Prior to the Convention, Mary had informed us that she intended retiring. We were disappointed by understood her reasons. Joan Humphrey, our Assistant Director, kept us working hard during the search for a new Director and in March 2007, we gained the expertise of Lucy Jones. Lucy went through a sharp learning curve but was assisted by Joan in the transition phase. Lucy directed us at Conventions in Brisbane and Hobart where we came third in the midsize section and fifth nationally. Two of our quartets also did very well. The Chorus recognised that we had a multi talented director, willing to try new things and take us in different directions. … We look forward to the next convention, however the main aim is friendship, singing together and creating the most wonderful sound. This is the best reward of all. – Excerpt from Sweet Adelines Australia 20th Anniversary Album (2009).